Artist's concept: NASA's Space Launch System. ROCKET TO JUPITER: The new Space Launch System [SLS] is going to be out-of-this-world powerful, according to NASA. How powerful? 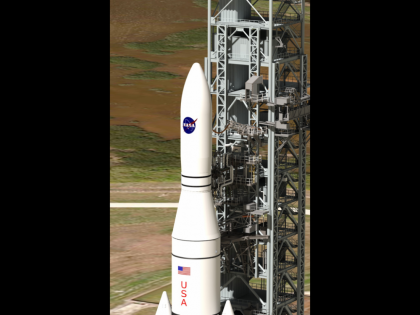 Now under construction, NASA’s Space Launch System will be the world’s most powerful launch vehicle. Designed to enable human exploration missions to deep space destinations -- including an asteroid and Mars -- SLS is working toward a first launch in 2017. During that first flight test, the rocket will be able to launch 70 metric tons (77 tons) of payload into low-Earth orbit, almost three times what the space shuttle could carry, according to NASA. From there, SLS will be evolved to a configuration that will be able to carry 130 metric tons (143 tons), more weight than any rocket ever has been able to carry. Scientists discussed the rocket during a meeting of the Outer Planets Assessment Group Jan. 13-14. The group “works to identify scientific priorities and pathways for exploration in the outer solar system past the asteroid belt, including the planets Jupiter, Saturn, Uranus, Neptune and their moons, and other destinations like comets and the distant Kuiper Belt Objects, including Pluto,” the press release said. WHOLESALE PRICES UP: The producer price index, which measures inflation in wholesale prices, rose 0.4 percent in December, after declining 0.1 percent in November, the U.S. Labor Department reported. For 2013 as a whole, producer prices climbed 1.2 percent, slightly below the 1.4 percent rise in 2012. Breaking the numbers down, food prices declined 0.6 percent in December, energy prices jumped 1.6 percent and other producer prices were up 0.3 percent. Most of the rise in energy costs came from higher gasoline prices. More than half the increase in the category that excludes food and energy prices was caused by tobacco products. This report was compiled with information from NASA and the U.S. Labor Department.